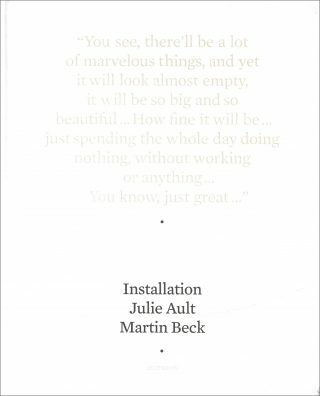 Julie Ault and Martin Beck’s exhibition titled Installation makes the different branches of their art practices evident, which include working independently and in collaboration with one another. Artist, designer, curator, writer, historian, editor suggest the primary positions and methods their practices embody, to be articulated in the Secession exhibition. Installation is primarily concerned with methods of authorship and artistic agency, and brings these modes that customarily use differing distribution circuits into a dialogue within a coherent space. 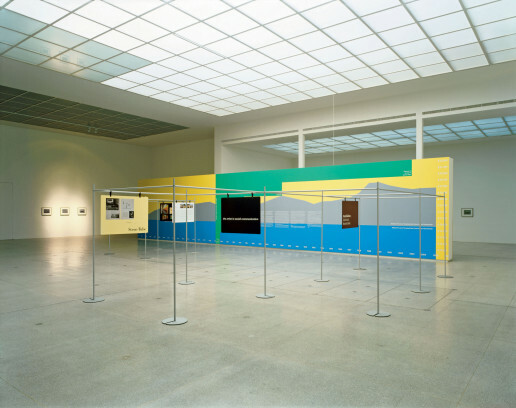 The exhibition consists of an arrangement of individually and collaboratively authored installation fixtures, arenas, and works that function as the display architecture produced specifically for the Secession’s space. The vocabulary inscribed by Felix Gonzalez-Torres’ series of photographs “Untitled” (Natural History)–Patriot, Historian, Ranchman, Scientist, Soldier, Humanitarian, Author, Conservationist, Naturalist, Scholar, Explorer, and Statesman–will parenthesize the exhibition. The photographs will be hung on the gallery’s permanent walls. The inclusion of this artwork expresses the curatorial dimension of Ault and Beck’s practice while the piece acts as a symbolization of facets of cultural participation. Its inclusion also references the newly published book, Felix Gonzalez-Torres, edited by Ault (2006). StrucTube is Beck’s reconstruction of a modular exhibition system originally designed by George Nelson in 1948. 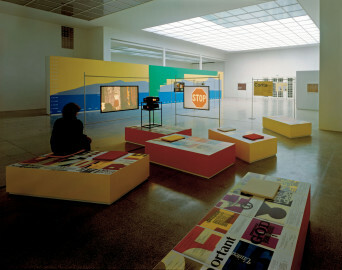 The system is one of the early precursors of many portable exhibition systems developed in the late 1950s and early 1960s, when the exhibitory apparatus and display were thought capable of realizing a utopian belief in the emancipatory potential of the exhibition as a communication format. 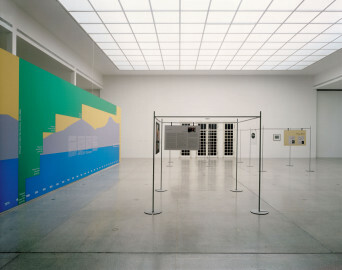 In Installation, Beck’s reconstruction of the StrucTube exhibition system is presented in a double way: as an individual work as well as a functional display system activated by Ault and Beck for the show as a whole. Information, a supersized wall mural, is an account of the history of the poverty measures and guidelines deployed by the U.S. government since 1964, merged with a graphic rendering of the increasing income gap between the wealthy and the rest of the American population over the past twenty-five years. This collaboration by Ault and Beck is an analysis of social and economic issues in an artistic form. For the Secession, Information is being made as a freestanding wall. Corita Kent (1918–1986) was a printmaker, activist, and art teacher renowned for her individual brand of spiritual pop art, and for her lively negotiation of the boundary that defined what a Catholic nun should look like, be like, and do in the 1960s. Serigraphs are the most lasting and coherent of the mediums Corita employed, but in addition to prints and other publication formats, she produced large temporary exhibitions and choreographed events. Ault has been engaged with Corita’s work for some time through curating exhibitions and recently authoring a book, Come Alive! 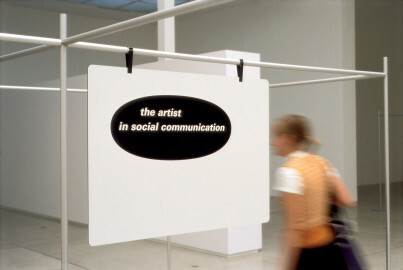 The Spirited Art of Sister Corita (2006). For the Secession, in order to highlight the ephemeral contexts within which Corita worked, Ault has curated images from Corita’s slide archive that present her milieu in the 1960s and some of the happenings and temporary exhibitions Corita and her students created. A double slide show will be screened in Installation, set-up in relation to a graphically articulated platform designed for the occasion. Rumor (June 14, 1969) is a project by Beck, consisting of three framed photographs and three bibliographies. The images show a façade detail of Paul Rudolph’s Art and Architecture building at Yale University in New Haven. The textual bibliographies document the shifting critical reception of that building throughout the last four decades. When first completed in 1964, the building was considered a modernist masterpiece, yet it proved to be difficult to inhabit. The building came to symbolize the crisis of modern functionalism and its relation to authoritarian structures. On June 14, 1969 the building suffered a fire and it is rumored, yet never officially confirmed, that it was set during a student demonstration. A two-channel video by Ault and Beck to be imbedded in the verso wall of Information, takes on the role of visitor orientation. The video addresses particular principles of exhibition as a medium and a form, and methods of exhibition making. The video draws on historical discourse and current imagery, and, along with the surrounding installation setting is made specifically for this exhibition. Julie Ault, born in 1957, lives and works in New York City. Martin Beck, born in 1963, lives and works in New York City.